Some people like to hear themselves talk. Some people like to hear others talk. If you truly want to take charge of your talent, then take the time to listen to what the listener has to say. No, this is not a Zen Koan. We’ve already established that one of the most powerful things you can do to take charge of your talent is to have a generous listener. A generous listener is there for you with an open heart, expresses an authentic interest in who you are, and reflects back to you what he or she is hearing. To take this dynamic to the next level, make sure that you are attentive to what your generous listener is telling you. Listen to the listener. Do you remember the game of “Telephone” where several people sit in a circle and one by one a message is whispered in the ear of the next person to the right. The fun is in hearing how distorted the message can become in 10 contiguous tellings. A great dialogue with a generous listener can work like a game of “Telephone” in reverse. Instead of the message deteriorating and distorting, it can blossom, be refined, clarified, and transformed into fresh possibilities for your talent. The generous listener may hear you in ways you had never imagined. Sometimes you may need to correct a misunderstanding, but at other times what the listener has heard can be a revelation. 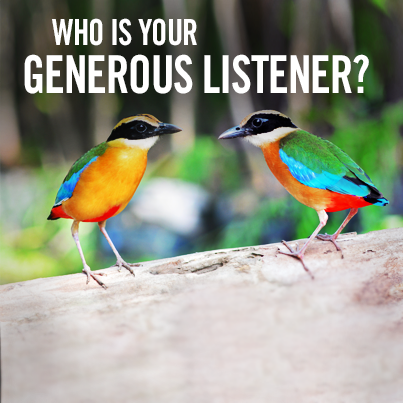 Having a generous listener is a great gift. Be gracious. Be smart. When someone takes the time to offer their listening, listen to what they have to say.